The purpose of music is to bring joy and inspiration to its listeners, to offer them light, fulfillment and maybe a new meaning. Good music has the power of awakening the best in us, of making us look at our life from a deeper perspective. However, in order to be able to express all the complexity of a musical piece, a pianist has to pass through the challenging studying process: dead-lines, exams, complicated problems and lots of emotions – how to cope with all that? No matter what we tell ourselves, concerts and exams are totally different things. Concerts are (or at least they should be) pleasant, enlightening experiences – both for the public and the performer. Exams are a ‘necessary evil’, being a perfect illustration of Nietzsche’s words: What doesn’t kill us, makes us stronger. After passing through the thorns and blood of a serious piano studying process, everything will seem easier – even the most difficult concerts. But the question remains valid – how do we cope with exams and the tremendous performance anxiety they involve? The first thing you should be aware of is that it’s impossible to completely eliminate all you emotions while you’re performing on stage. What we need is to get rid of negative, destructive forms of anxiety and to keep the positive emotions and the necessary levels of concentration. Positive emotions are always necessary for bringing life to a musical piece. A performance without a spark of emotions which reflect the content of the piece is extremely boring. Now that we’ve delimited these two different forms of emotions, let’s move to the next step and learn how to eliminate (at least partially) the destructive ones. A Buddhist proverb says: All the suffering of this world arises from a wrong attitude. The world is neither good nor bad. It is only the relation to our ego that makes it seem the one or the other. This fundamental concept can be applied to all the areas of our life. What is your attitude towards music and piano performance? Does piano playing bring you joy and fulfillment or is it just a duty, dictated by your parents, relatives or maybe just something meant to make you look more sophisticated? Only in the first case the positive emotions can conquer the negative ones. Then, what’s your attitude towards exams and contests? Of course, there’s no need to be hypocrite and say that exams bring you pleasure. However, you should also understand that they are not public executions either. Treat them with calm and even a little humor – after all, there’s no way we can skip this necessary step on the long stairway towards becoming a professional pianist. The second (but not less important!) secret that will help you cope with exams is hard work and daily practice. Yes, it’s as simple as that. Instead of worrying, being superstitious or complaining that the pieces are too difficult, you should concentrate on your practice. When you’re studying, leave the emotions aside – simply practice, with patience, dedication and perseverance. Soon, you’ll discover a simple truth: the more you practice (and I don’t mean mechanical, brainless practice – only the mindful practice really matters), the more confident you’ll feel and the less anxiety and negative emotions you’ll have during the exams. In the end, anxiety is fear of failing. Did you ever try to analyze how anxiety appears? In fact, it’s very simple: we give a certain event – in our case, the piano exams – a huge importance, as if our entire life depends on our performance. Fear of failure becomes then a natural consequence – after all, our subconscious tells us that failure is absolutely unacceptable. Fear creates tension. Tension creates insecurity. Insecurity leads to stress and anxiety. All these factors, instead of making us play better, are in fact causing even more problems. The more we’re afraid, the more tensed we’ll be ad the more mistakes we’ll make during our performance. So what is the solution? Lower the importance of a certain event if you want to succeed! Don’t be afraid of failure! I know it’s easy to say this, but how can we really do this? Again, by changing your attitude. So what if you make a few mistakes? Accept the fact that failure is not a disaster, but an important step towards success. Nobody will kill you for failing. In fact, it’s quite the opposite – in most cases, we’re our most severe critics. Only after accepting this simple truth, you’ll notice a wonderful paradox: the less importance you give a certain event, the more chances of success you have. This is, in fact, one of the most powerful laws of our existence. By using it wisely, you can truly become the master of your life. But beware of a dangerous trap: giving less importance to something doesn’t mean being lazy, disrespectful, disorganized and unserious. Just do your work (or your piano practice) with love and concentration, and let the universal balance do the rest. Only by stopping worrying you can have wonderful results in all the areas of your life. Besides the change of attitude, the confidence which appears as a result of constant mindful practice and the ‘adjustment’ (in your mind) of the importance of the exam, there are other necessary things that every musician should do – not only for emotional control, but also for improving his/her physical and mental health and well-being. One of the most important ‘mental techniques’ you have to learn is the relaxed concentration. It’s that state in which you’re calm and focused, controlling all the details of your performance without losing your serenity. You’re mindful without being tensed, relaxed without losing your awareness. The best way of learning how to master this state is to practice meditation. Correct breathing is also crucial in controlling and eliminating anxiety. My advice is to start practicing yoga today and continue to practice it for rest of your life. Even if for some reason (though I cannot imagine one) you don’t want to practice yoga, you can still learn how to do separate breathing exercises. The breathing techniques are proven means that will simultaneously harmonize your physical and mental states, equilibrating your nervous system and the functioning of your entire organism. After learning and applying the basics of correct breathing, you can start studying how to work with your energy. There are different methods of doing this. Yoga remains one of the best ones, because it combines many elements which are essential for our health: correct breathing, energetic training, flexibility, endurance, strength and patience. You can also learn how to channel your energy by practicing martial arts, meditation, Tai Chi or simply visualizing the main energy channels and learning how to control the energy flow. I will not explain in detail all these techniques, you can find lots of specialized information online and not only! Besides all these rather sophisticated techniques and methods we should never forget that our static piano practice routine should be compensated by constant physical exercises and a dynamic lifestyle. Being active – walking, jogging, playing team sports or practicing any other activity that you enjoy will not only keep you in good physical shape. By activating your body’s hidden potential, physical exercises will bring forward the best in you: you’ll be healthier, stronger, more confident and full of energy; at the same time, you’ll feel happier, more positive and flexible not only physically, but also mentally. Problems that seemed unsolvable until recently will be just minor inconveniences. This way, the whole process of learning how to cope with exams can be regarded as an upward spiral: you start by having a healthy attitude, you practice enough for developing more confidence, you start learning breathing and energy exercises, you begin having a more dynamic lifestyle and you reach a new, higher level of awareness that will automatically generate a healthier, wiser attitude. After a while, exams will stop being insurmountable obstacles and causes of uncontrollable anxiety. They will be simple steps you have to take in order to be able to become a better pianist and musician. Thank you for your comment and for your wonderful blog post about our concert on 29th of December with the National Symphony Orchestra of “Teleradio-Moldova”! Best wishes and have a peaceful new year filled with good people, good music and great ideas! I tried all the above for months and also went on a course to deal with exam nerves. I took my piano G2 last week and although apprehensive, I was looking forward to it as I felt well prepared. I felt calm waiting; but because the exam was so rushed with no time for settling down, I was unable to control my breathing, shaking and nervousness and made minor errors in all of it, plus I messed up the 3rd piece. I am despondent because I did not do myself justice and unsure what to do. Any advice would be grateful, please. Not only my students are encountering this kind of experience from time to time – ALL professional pianists during their training years pass through all sorts of similar difficult situations, the so-called ‘thorns and blood’ of the studying process. We have to understand and accept one thing: we are human. No matter how hard we work, uncontrollable situations still may appear. However, we can and should change our attitude: little failures are always an indicator of future success. The winners are not those lucky people who make no mistakes, who have no emotions and who do everything perfect. Winners are those who never give up, in spite of failures and unfair situations. Piano playing is an incredibly difficult art :). The road to a new level of mastery is never smooth nor easy. Each small failure is a priceless lesson – next time you’ll be more prepared for such ‘rushed’ exam situations. The important thing is: never give up and don’t stop working on your emotional control! Continue to implement the principles I recommend in this article (and other useful advices you can find) – persistence is a magical weapon! :). Practice regularly, have a calm and confident attitude when you work, relax your mind and your arms without losing your concentration and… don’t pay so much attention to the negative experiences! (remember the principle: “Lowering the importance of the event”? It’s a life savior for piano students, believe me!!!). Also, don’t forget to balance your piano practice with dynamic activities – you have no idea how helpful it is! I wish you good luck in your practice! Many thanks Ilinca for your most helpful and kind comments. I have been playing for just over a year, so I suppose I did not do too bad. I will keep trying to improve my mental and emotional health so that I will be more prepared for the ‘rushed’ exam situation. It makes me think of going in and out on roller skates! Lowering the importance of the event sounds very soothing and may work for me next time. I passed my Grade 2 piano exam, but I’m feeling very disappointed with the result, as I could have done a lot better had I not been so nervous in the ‘rushed’ situation. It’s so frustrating when I can play at distinction level in my lessons, yet not be able to do myself justice in the exam. I am endeavouring to follow your 7 basic steps. For my next grade I am not only going to prepare all the requirements thoroughly like I did with the G2, but now learn to thoroughly prepare myself mentally, physically and spiritually. As a start I went through the Grade 3 scale and arpeggios book in an hour on my own! My teacher is lovely and laughed when I came readily prepared at the next lesson. Good luck with any future exams! We always play differently in different circumstances. When we play alone at home we usually play the best :). In front of our teacher or our family, we usually have the feeling that something bothers us and the interpretation is more tensed. And, finally, playing before an audience is the hardest – it’s when we make the most mistakes even if at home or during the lessons everything goes great. Why is this happening? It’s very simple: at home, practicing, we concentrate on the music. Nothing bothers us and we get used to this ‘secure’ feeling. Then, when somebody is listening to us, the atmosphere changes. The feeling of ‘being listened to’ makes us see everything from a different perspective – for some it’s a good thing, while for the majority of us it creates problems most of the time (forgotten text, technical mistakes, tensed interpretation, lack of musicality etc.). Grateful thanks for your invaluable advice which I could really connect with. I felt very reassured by your explanation about feeling secure and insecure in different circumstances. You are wonderfully kind to take the time to help me and other people in this way. I hope it has a two way process for you in that you gain from sharing and imparting your knowledge and experience as well. As well as the next exam pieces, I’m now learning some pieces for enjoyment and to play to anyone who dares to listen! I’m hoping that the two different experiences will marry up in time, so that all performing that I do becomes an enjoyable event. Lots of good wishes to you. Thank you for your warm words, Pauline! I’m really glad that I’m able to help and, as you say – it IS a rewarding two way process :). Thank you for sharing your experience with us! Have a wonderful piano journey! Dear Ilinca, is it possible to learn a sonata in one month? The Sonata KJV 283 in G major by mozart, is what I should be able to play by June 31st. However, I left the sonata alone and studied other pieces, and now I am facing this terrible deadline… Currently I am in grade 5, and for my graduation it would be necessary for me to play the whole sonata and the Rustle of Spring by Christian Sinding by heart. I am 16 years old, and I recognize my lack of responsability… however, if you happened to be in my situation, what kind of plan would you follow to finish the sonata and the Rustle of Spring? I have already played the Allegro and I have memorized it… currently I have been “trying” to study the Preto… then there is the Adante… Please help me. 1. The pianist should have enough experience. I believe that since your professor trusted you with such complicated pieces, you are experienced enough. 2. It’s necessary to have a constant ‘healthy’ practice routine (practicing at least 4-5 days a week) for several months before engaging in such a challenge. If you’re not used to hard piano practice, there is the risk of developing a muscle strain or hand injury if you practice more than your hands (and your mind) can resist. 3. In fast learning, there are two dangers: one is the above-mentioned risk of developing a hand injury; the other is the incapacity of our brain to assimilate such a big volume of new material in such a short time. Usually, if the new music is not properly ‘assimilated’ and deeply understood, it can sound ‘raw’, mechanical and tensed during the exam. If the music is well-assimilated, on the other hand, the performance will be relaxed, mindful and full of meaning. 1. Stay calm and positive. It’s the best chance of success, believe me! Think like this: “If I succeed, it’s great! If I don’t, it will be a good lesson for me to learn – and it will NOT be the end of the world. Next time I’ll be more responsible” :). Failures are stepping stones towards success, ONLY with the condition that you never give up and you have a correct mindset :). So forget about stress and anxiety and just START WORKING with perseverance and determination. The calmer you’ll be, the faster you’ll be able to learn. 2. Assess your goal (3 movements of the sonata and the Sinding piece) and make a reasonable plan. Even if it’s not possible to work every day on the entire program, try to work (not play mechanically, but WORK) on the whole material at least every other day or two. For example: today you work on the first and second movements of the sonata, and tomorrow – on the 3rd movement and the Rustle of Spring. Make the plan according to your possibilities. Change the practice routine at the first sign of discomfort. 3. How many hours per day do you usually practice? If it’s only an hour (or less), don’t start practicing 5-6 hours per day – you’ll kill your hands! Begin by practicing 2 hours for the first couple of days: 1 hour, then 15-30 minutes break, then another hour. If you feel comfortable, after several days increase the ‘quantity’: 1 hour and a half, break, and then another hour and a half. Don’t play more than 2 hours at a time if you’re not used to it! Allow your arms and your head to relax, to clear and to get ready for the next practice session. 4. Don’t forget about your posture! Straight spine, relaxed, heavy shoulders and arms, flexible wrist and rounded fingers! AVOID wrist tension – it’s your worst enemy! 5. Compensate you piano practice, even if you have to meet a deadline! I’ll correct myself – especially if you have to meet a deadline! :). I hope this article – How to Compensate Your Daily Piano Practice Routine? – will be helpful. Concentrating only on one thing – your exam pieces – can be devastating for your health and emotional balance. Go out between practice sessions, have long pleasant walks, watch the birds, the animals, the grass and the trees – enjoy the moment! Otherwise, what’s the point of it all? 🙂 When you clear your head properly, you’ll be able to assimilate the music faster than usual. 6. If you do physical exercises on a regular basis, don’t stop! On the other hand, if you’re not used to strenuous physical trainings, now it’s not the best time to start – all you have to do is spend more time outdoors and walk as much as you can – your brain needs all the oxygen you can get! 7. Listen to good recordings. Check out YouTube, but don’t listen to amateurs, only to professionals (such as Barenboim – he plays the Mozart sonata wonderfully). The impression of a master’s performance can be more helpful than many hours of mechanical ‘mindless’ practice with no definite musical image in mind. On the other hand, if you know where you’re going, you’ll get there faster! That’s all for now! I could write a few more pages on this subject – it is an endless one, after all – but information overload can be as dangerous as lack of information :). Good luck in your practice! If you have more questions regarding your deadline, please ask! Im 13yrs old and im doing my grade3 on the 20th june 2011 im really scared and today (17th june ) i have very short time to let myself go and be confidence on the exam. Also im doing my grade4 on the 15th july is it possible that i can manage it in such a short time. I have school exams and i cant let myself go…….. please help me!!!! will i be able to pass it on both of my exam in such a short time i nearly practice every day even if its only 30-40 min but sometimes i go over the limit of time like 3-4 hrs and the next day 1hr…..
Having two exams in such a short period of time is definitely very challenging! First of all, what exactly are you playing? How many pieces do you have to learn for the exam on 15th of July? For example, learning 2-3 easy pieces is not so complicated and can be achieved in a month, but if your program is more complex – the situation changes. Read my comment above (my answer to Amanda from May 25) – I hope it will be helpful for you as well! Also my grade 3 I gave the exam and I think it went very well , All thanks to you Ilinca all this calm word made me feel really calm thank you many times…..
I’m glad that your grade 3 exam went well! The pieces that you have to play are fairly easy, but it’s normal to have at least 2-3 months for learning such a program (especially when you’re in 3 grade!). Why do you have to learn it in less than 1 month? Yes, I think it’s possible to learn all the pieces and the scales until 15th of July, but you’ll have to make a daily practice plan and follow it. Again, read my reply to Amanda from 25 of May where I explain some methods of accelerating the learning process. One more advice – if you succeed with your exam, it will be great! If you don’t, it will be good as well – you’ll give this exam later. I made some research about ABRSM exams (we don’t have them in my country) and I understood that you can pass them when you’re ready. I passed my grade 4 with a ‘pass’ which is kind of ok for me but I’m glad that I passed it. Now I’m on my grade 5, I found the scales and arpeggios pretty hard but it’s ok.
Now it’s the best time to improve your practice habits, this way making sure that it will be easier to pass your next exam! I’ve recently created a page – Ask Me a Piano Question – where I reply to piano-related questions (with examples from scores, pictures and videos!). Hope to see you there soon! First, take a deep breath. For several minutes, just breathe deeply and allow your mind and body to relax. Sit comfortably or even lie down and don’t think about anything! Then, you can think how much you enjoy to play beautiful piano music and how sharing this beauty with the audience is much more important than what somebody else will think about your performance. Perform this kind of meditation every day – in time, it will significantly change your attitude and your self-confidence, making you less nervous and jittery before exams. Your passion for what you do is the biggest antidote against stress and fear. Until your exam, practice calmly, with relaxed arms and wrists, in a slow/moderate tempo. You can play the pieces in the needed tempo once or twice per day – but only after you warm up properly and you practice in a correct, relaxed manner. Playing fast for too long will only increase your tension – so find balance in your practice and make sure you always sit at the piano with a positive, confident and calm attitude! Our state of mind is the most important thing when it comes to exams and not only! Also, read my article above carefully and try to apply as many of the 7 steps as you can. Of course, you don’t have to start working out intensely now (your exam is on Saturday and you need all your energy) and you also won’t be able to learn too many new things in 2 days – but you can certainly do the rest: change your attitude (think how much you ENJOY playing the piano), lower the importance of the event, breathe deeply and take things easier! You can also read my reply to Pauline from April 18th – it is appropriate for your case as well. Good look and keep us posted! Glad I could help! Looking forward to seeing you again on PianoCareer.com! I love this artical because it contains a lot of “morals” that I learned in the hard way! I’m reading it for the second time now, and I plan to read again and again….! Thanks for the comment! 😉 Yes, most of the things which I described in the article above I learned the hard way as well – and I always hope that I’ll be able to help other pianists learn them the easy way :). On PianoCareerAcademy.com there will be a special board dedicated to this subject. It’s called Piano Performance and there we’ll discuss all the performance-related dilemmas, problems and struggles a pianist may come across. I’m happy that you enjoyed my articles! Mindfulness comes with correct practice and experience. 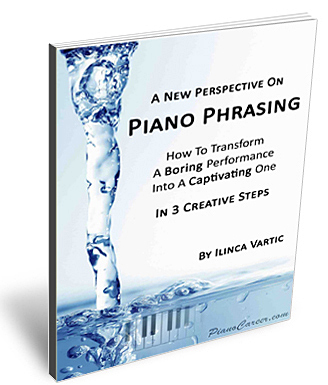 Did you read my report “A New Perspective on Piano Phrasing“? There you’ll find many helpful tips about the art of visualizing a certain melody or phrase before playing it. In other words, don’t play mechanically, by simply pressing the keys without thinking about the meaning and character of the music. Before playing, imagine HOW the piece (melody) should sound like – and allow your mind to guide your fingers! 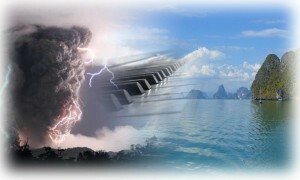 For having access to more information on this subject, join my Piano Coaching Program at PianoCareerAcademy.com ;). I have my grade 7 piano exam on wednesday (the day after tomorrow!) and I’ve been preparing for it for over a year because I’ve been preparing GCSE pieces and compositions at the same time (I’m nearly 16) so it feels really important to me that I do well in it the first time! The trouble is, no matter how prepared I think I am or how confident I feel before the exam, I always feel dizzy and panicky in an exam and my hands shake and sweat so much they just slip off the keys (disgusting I know!) which makes one of my pieces – the cuckoo by daquin which is very fast and quite long – particularly hard, but I am most scared about contrary motion scales which I still never get right first time even when practising, and the sight reading because the last exam I took was grade 4, and there is a big difference in sight reading since then! I think your website and comments are really helpful and kind, but do you have any extra tips on the scales and sight reading that I could try before Wednesday? I know the nerves are all down to me, but if I could just feel more confident about these things it would really help I think! I’m sorry I couldn’t reply to your message earlier – I’m extremely busy with my Piano Coaching Program at PianoCareerAcademy.com, and I answer questions chronologically. You’re right – your problems are all anxiety-related. My first advice is to take a deep breath and to relax your mind and arms – every time you practice and before exams as well! Then, during the exam itself, you have to focus on being relaxed and on enjoying what you do! In all my articles and tutorials, I emphasize the fact that the most important thing in piano playing is enjoying sharing beautiful pieces with your audience (yes, even during exams!). By the way, did you read my article How to Handle Failures in Piano Playing? 16 Perspective-Changing Steps? You’ll find many useful tips there! When you practice – no matter if you play scales or pieces – first of all control your relaxation. Your fingers slip off the keys not only because you have sweaty palms. First of all, it happens because of tension, because your shoulders/elbows/wrists are not entirely relaxed and flexible. When there is no relaxation – there is no stability, because the weight of your arm, instead of going into the depth of each key (this way ensuring your stability AND technical accuracy) remains ‘trapped’ in the tensed joints, being the main cause of wrong notes and instability. Then, don’t forget that it’s not possible to make wonders in two days, before the exam. For making sure that your next performance will be really successful, you have to practice correctly on a regular basis. For example, if you practice scales, begin your practice in a slow tempo, with relaxed arms and wrists BUT with sharp, rounded, well-articulated fingers (finger articulation means lifting each finger properly so every note will have a clear, expressive sonority). You can practice hands separately first, then hands together, gradually increasing the tempo, but without losing the feeling of control, comfort and relaxation. If you feel that a faster tempo makes your arms/wrists tensed again, go back to a slower tempo and repeat the process! Sight-reading: the main secret when it comes to sight-reading is practice. By the way, several months ago I answered a similar question in detail (about improving our sight-reading). Click here to read my reply! And, of course, you can find LOTS of information on all these topics (correct practice, anxiety control, sight-reading etc.) on the Private Members Forum at PianoCareerAcademy.com. I did already have my exam, but your advice will be really helpful for future performances and exams – thank you very much! I think it went alright, there were mistakes in the scales and aural tests and sight reading but nothing major, and the daquin piece had a few problems aswell but the other two were as good as I’ve ever played them so I think they will make up for it! I will certainly read your article and your sight reading answer, and thank you for answering me in such detail! I’m happy to hear that your exam went well. Minor mistakes are normal – they are part of the learning process! 😉 What matters most is the overall progress – and it is inevitable if you practice correctly! I’m taking my grade 10 RCM practicals in a few days..and I am panicking because I still haven’t memorized 3 of my pieces..and barely touched the scales, sight reading, ear tests and such… what should I do? Is there a good plan I can follow to make sure I at least pass? Sorry for replying with a delay – I’m very busy with my work (the Private Members Forum at PianoCareerAcademy.com). I have only several minutes in the evening for keeping up with comments and emails – and I usually reply in chronological order. Did you have your exam already? If you didn’t – take a deep breath and calm down. This is always the first step! 😉 If you want to learn something fast (which is not easy), you have to be as calm and focused as possible. Our brain does not operate well under stress. We get tensed, we risk developing hand injuries, we ruin our health – and we also ‘sabotage’ our productivity! I know, this is easy to say – but it is the only thing that can make a difference in your situation! And now, please allow me to be honest with you. You are grade 10 and you have already lots of experience. You know that learning a piano program is not something that can happen overnight. Yet you decided to leave your practice for the last moment. This is ok, as long as you accept the consequences (not being ready for the exam). If, on the other hand, you couldn’t practice because of an illness or other attenuating circumstances, you have the right to postpone your exam! But, as I said above, you should change your attitude and calm down. You have to understand that what happens now is a consequence of your own choices. This is not a bad thing – this is a lesson that will teach you to be more organized in the future. Then – focus. Concentrate on the most significant elements of your task (the ones that make more than 50% of your success at the exam). Practice in a calm, very relaxed manner, without hurry and without panic. The best way to memorize a piece is to analyze it logically, to understand all its patterns, repetitions, musical phrases etc. When you do this – suddenly everything will fall into place and you’ll know it by heart! By the way, I explain in detail how to do this in many of my exclusive tutorials on PianoCareerAcademy.com :). And, most important – don’t practice 10 hours per day and don’t try to learn in 3 days everything you haven’t learn in several months. This way you’ll only hurt yourself – so please be careful! It’s better to fail the exam and pass it later than to develop an irreversible hand injury! Health is ALWAYS more important!!! I tried to practise my piano since i’m having a test soon but the thing is i get lazy and don’t feel like practising the songs, I don’t really get nervous but i want to achieve a high score along within a short amount of time, is there a way besides practising. a more fun and exciting way instead of just sitting there???? Practicing CAN be fun – but only if you practice correctly, with focus and awareness, playing music that you truly enjoy (and not simply some ‘songs’ assigned to you against your will LOL). However, if you really want to become a good pianist, hard work cannot be avoided :). But if you enjoy it – it will make all the difference! I have got my grade 2 exam in under 2 weeks time And I am already extremely nervous. I have been learning my pieces for a long time and am starting to get really sick of them!!! I really don’t want to fail my exam and have to keep practising them until my new exam. But I still can’t stop worrying that i am going to get to my exam, sit down and then have a mental blank and fail the exam. I feel really ready and I just wish my exam was tomorrow so I could get it over and done with. I don’t know if I would be able to do it all again. Some helpful hints would be greatly appreciated!!! I just found this site and it’s very helpful! If you could help me with this, it would be greatly appreciated! Tomorrow, I am going to be performing in a concerto competition. I am playing one movement of a Mozart concerto. I’m usually nervous before I play, but I’m not nervous when I get on stage. I memorized the whole concerto, but I hope my mind doesn’t go blank in the middle! Also, do you have any tips for giving the concerto a playful or innocent sound? I try not to be too serious, and the concerto is very playful, but I just don’t know how to achieve a good “playful” sound. I also need some help on playing on a dull piano because the piano in the competition is apparently dull. Some tips on keeping a steady tempo and being coordinated with the orchestra would help a lot, too! Thank you so much and I’m looking forward to reading more posts!! This site is very helpful! I hope that your performance went well! Im having my diploma piano exam later. This is so nervewrecking. I had been crying for a days and i tried my best and play everyday(coz im going to college, and i have time management issues). Yesterday i even made my hand ached because i still cant play my pieces smoothly and firmly as i want. I failed g8 twice, i dont wanna fail again. I told myself that if i fail again, ill quit piano. Just realised that i havent post this, well the exam is over and i dont think i will pass, mistakes and missing notes. I cried so hard, i felt so guilty coz my mum worked hard to pay the fees. Then, my mum say if i want to i can still take degree but i dont have faith anymore. I cant trust myself to do well anymore. My retardiness is dragging me in to a deep mud. Any advice? hi.. thanks for your article. tomorrow will be my recital . this will be a great help. Godbless. I love your informative webpage. I’ve my flute grade 8 exam ( not piano) next week and I really like your suggestions here, especially to focus on how beautiful the music. Because music is meant to be beautiful, and even exam pieces can be too! I still play the piano and perhaps one day I’ll get back my piano and the challenge of sitting for a grade 8 piano exam. It had been on the back burner for nearly 20 years!! Your articles inspire me, thanks you! I am very passionate about piano and music in general. I would like to continue in it as a future career. I was afraid that maybe all the stress of the constant exams would take the joy out of music for me but now I have realized that if I don’t at least try to go for piano, my dream, I will forever regret not taking the chance. I am preparing for my grade 6 piano practical exam and it’s going fairly well. I am still extremely nervous because last time I took a practical exam, i panicked and forget most of my memorized pieces. This did not cause me to fail my exam, but I am really worried about it happening again for the next one. I am a perfectionist and I really want to get a good mark. I practice dedicatedly every single day and I really have a passion for piano playing that I don’t think I could live without music. But I am scared that I am going to panic again and forget. I have a history of stage fright and get very bad anxiety sometimes. I would love your opinion on how to overcome this anxiety and if this anxiety makes it impossible to continue in playing music for my future career. Thanks and I love your article! PS. I have my first basic theory exam tomorrow and I’m really scared so if you see this in time I’d love some pointers on that too. Thanks so much. Ilinca would love to write a detailed reply to your comment – but unfortunately her work schedule is completely overloaded at the moment (she dedicates her entire time to designing, recording and publishing weekly super-detailed video tutorials for our members at PCA – as explained in our FAQs, answer No. 14). I’m really sorry to bother you but I would like to ask you a question. My piano exam are in 2 days and I haven’t mastered neither of my 3 piece’s endings. I must admit that I pushed myself to the limit this year by taking dance, English, French, tennis and basketball classes, and extra school work. The result was leaving piano a bit behind. I was truly irresponsible and didn’t study properly, because I simply didn’t have enough time. Even with so little studying , actually the rest of the pieces (apart their endings ) are really well worked and I’m able to play them without making any mistakes. I have spoken with my teacher and she suggested me to play only the well mastered parts but I am honestly afraid to face the examiner and admit that a certain part of my pieces is inappropriate to be played at exams. I will also mention that there’s nothing much you can do at the moment (yes, it’s entirely possible to learn the endings for 3 pieces in only 2 days, but only if you are already pretty experienced, and if you practice very mindfully and correctly). However, you CAN (and should) learn how to increase the productivity of your practice for the future, so that situations like the current one will never occur, and all the fragments of your pieces will be equally mastered :). You’ll discover all the professional secrets of correct piano practice by watching/reading the tutorials available on PCA :). Hey there! My Grade 8 Practical Exam is in two weeks, but I am really worried for it. I can’t seem to play my second piece (Mozart) well and constantly struggle with the trills and the alberti bass, although I am able to memorise the entire piece and can play it without the score. I am also unable to control the pedalling for my third piece (Chopin) and it sounded too rushed at times that I want to “inject” my own expression. How and what should I do?